When it comes to over-the-top blood and guts the first two films that come to mind are Sam Raimi's Evil Dead 2 and Peter Jackson's Dead Alive (a.k.a. Braindead). But now a third one has been added to the list and it's DEATHGASM (Spelled in all capital letters because lowercase is for pussies). 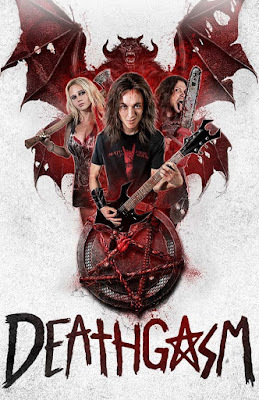 DEATHGASM is about Brodie (Milo Cawthorne), an outcast in a sea of jocks and cheerleaders until he meets a kindred spirit in fellow metalhead Zakk (James Blake). After starting their own band, Brodie and Zakk stumble across the hideout of their recluse idol Rikki Daggers (Stephen Ure). Daggers realizes he has been outed and gives Zakk and Brodie a record and tells them to guard it with their life. Once home Brodie discovers sheet music inside and decides to use it for his band. But unknown to them, the music also summons an ancient evil entity known as Aeloth The Blind One, who threatens to tear apart existence itself. After playing the music their classmates and family become inhabited by demonic forces, tearing out their own eyes and turning into psychotic murderers. The film is written and directed by Jason Lei Howden who has done visual effects for a slew of major studio films (Man of Steel, Hobbit, ect. ), but DEATHGASM marks his feature debut behind the camera. (I could go into detail about his career, but I think you should hear it in his own words on The Movie Crypt.) Howden does an amazing job blending horror, comedy and metal into a film that draws from others, but stands firmly on its own. Howden's timing is on point with witty dialogue and shots that sell each kill just right. The practical FX are outstanding and are what horror fans love to see. Every decapitation, gutting and eye gouging is done in beautiful fashion hearkening back to the 80's heyday of classic gore. A few shots do have CGI, but it is not used enough to detract from the overall film. Milo Cawthorne and James Blake do an outstanding job as the leads in the film and are granted some of the most spectacular kills throughout. But Kimberly Crossman (Medina) shows off her acting chops and is given the sweetest axe kill every put on screen. Think Uma Thurman from Kill Bill but surrounded by demons and having an axe, yea it's that badass. The music is just as important as the story and it really adds to the atmosphere of the film. It finds that sweet spot in Metal music that even non-metal fans can enjoy. If you have ever seen Todd and the Book of Pure Evil then this is right up your alley. DEATHGASM is an all out, balls-to-the-walls, gore soaked adventure. If you like Metal, Evil Dead, Dead Alive, Todd and the Book of Pure Evil and carnage, then you are going to love this film. If you don't like any of that but enjoy blood soaked 80's horror, then you are still going to love this movie. I can't wait to see what Jason Lei Howden does next, because this was an awesomely amazing entry into the horror genre.